The hospital is equipped with the latest digital xray machine, that aids a fast diagnosis. 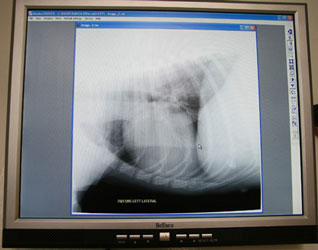 Xrays are stored digitally on a computer rather than on film. 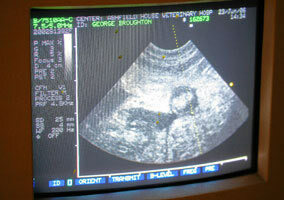 Ultrasound scans are helpful in telling us what is wrong with your pet. The scans are not uncomfortable at all, in fact they are the same as a human pregnancy scan.Hair may need to be clipped away though. We can get information eg about heart disease, liver and kidney problems and even some eye problems. We have also scanned snakes!